"Temporary Rigging Seminar at 10 Chimneys"
The Fall Section program, held at "10 Chimneys" in Genessee Depot, Wisconsin, included a seminar on temporary rigging, presented by Michael Reed, founder of Reed Rigging, Inc. of Chicago. Mike's company specializes in temporary rigging. Temporary rigging has long been a staple of arena rigging, and most of the techniques were developed there, but the technology has now become common in theatrical venues as well. Theatre has gotten larger and heavier, outgrowing traditional counterweight systems. For today's shows, temporary rigging now applies to as much to the legitimate theatre as it does to the arena. Reed quoted Harry Donovan, author of the standard text on the subject, who said, "When you think about Rigging, you're thinking about killing people or not killing them". As a rigger, Reed keeps this in mind to make sure he stays serious about the job. It makes sure he pays attention to what is important. Rigging can be dangerous, both for riggers but also for those below. This fact is attested to by many recent rigging accidents, but that doesn't mean accidents are inevitable. Most accidents are a result of lack of forethought, not noticing problems, or lack of knowledge. Reed presented the "Rules of Rigging" that he follows. 2. If you think it's unsafe, it probably is. 3. Know your safety factor. On the topic of a safety factor, more properly called the "design factor", Reed said that current practice is to use a factor of at least five times the expected load. Thus, for a 1000 # load, you would need hardware able to handle at least 5000 pounds safely. The extra capacity helps cover unexpected or unknown issues that may arise on the job. Dynamic loading must also be considered. It will multiply the stresses on the system significantly. Mike reviewed typical "tools of the rigging trade". First were slings. 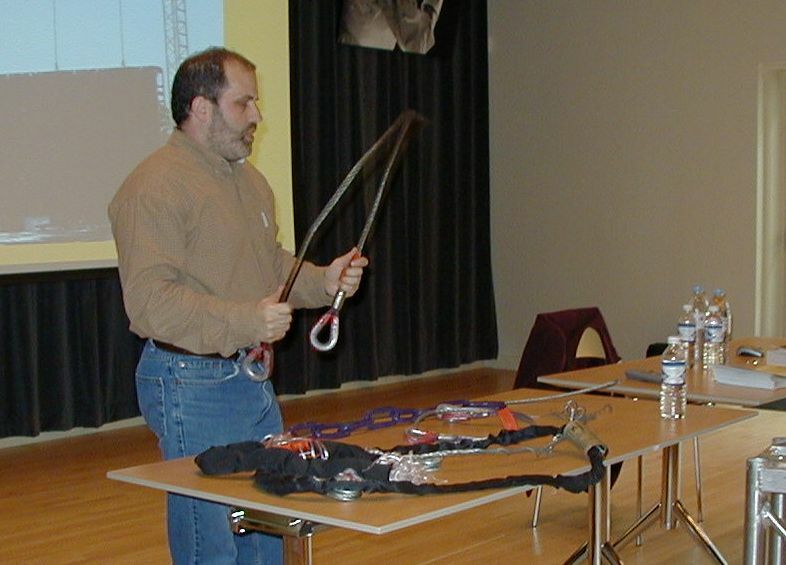 There are three commonly used types of slings used to support theatrical loads. First is the "span-set", more generically known as a round sling. This consists of a continuous strand of polyester yarn wound in a coil and covered in a polyester fabric sheath. Round slings are usually used around the truss to lift it without collapsing the tubing of the truss chords (the horizontal pipes forming the frame). Round slings are very strong (+10,000 lbs. when used as a "basket") but melt easily, and they are easily damaged by sharp edges. The rule of thumb is, if you can "see red", i.e. see the red-colored strands inside the sheath, the sling is compromised and must not be used. Next is the steel rope sling, made of 3/8" or 1/2" aircraft cable with a swaged eye on the ends. These are less flexible than round slings, but far more durable and heat resistant. They can be used over steel beams for overhead support, provided a burlap bag is used for padding. Round slings are simply not suitable for this. Finally there is GAC-Flex. These are fairly new and similar in construction to round slings, but use a continuous coil of 1/16" "Galvanized Aircraft Cable" inside the cover sheath instead of polyester yarn. They are also quite strong, and are unlikely to melt. They can be used for "permanent" rigging installations, for which round slings are unsuitable and often illegal. We also looked at "deck chain". Borrowed from tug boats, deck chain is a large-link chain used to make small adjustments in cable lengths as needed. Today, the exact same chain has been re-dubbed "Special Alloy Theatrical Chain", but it is still the same chain. Next Reed discussed truss. He emphasized that truss MUST be oriented correctly. Most box truss has diagonal bracing on two sides and parallel spreaders on the other two faces. The diagonals MUST be the sides and the parallel spreaders the top and bottom, or the truss will likely fail. 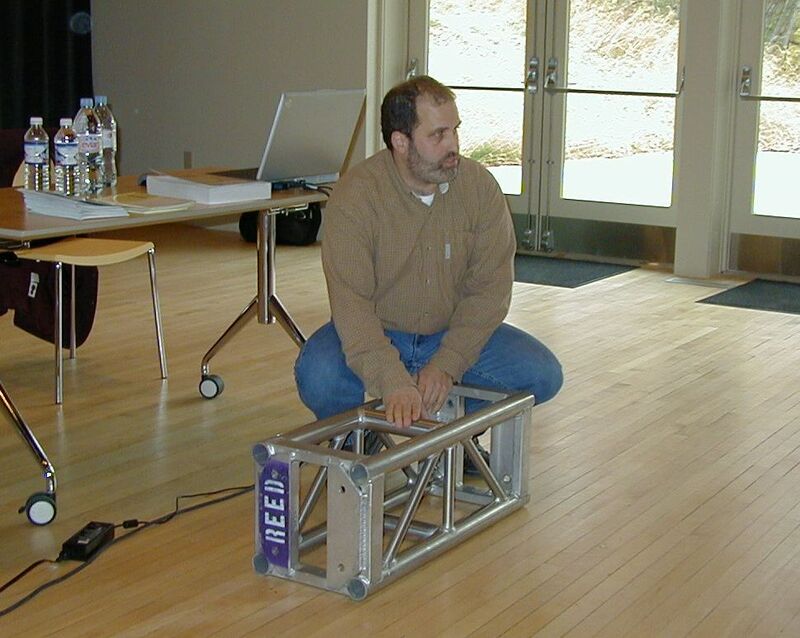 Used in an incorrect orientation, a truss has very little strength. We examined various manufacturers load tables. It is important to follow the manufacturer's guidelines regarding loads and distances between support points. For instance, given a 1 ft. box truss 40 ft. long, supporting a distributed load of 1000#, the stresses on the chords (the horizontal pipes) at the center of the span will actually be more than double the load, exceeding 2200 #! At the same time, the load will taper off to a fraction of that, about 270 #, at each end. So it is no surprise that a long span will fail under relatively modest loads; the stresses involved can be tremendous at the center of the span, perhaps beyond the strength of the truss. Attention must also be paid to deflection. All truss (or any beam) will bend under load; exceeding the allowable limits and risking catastrophic failure. Allowable deflection can also be checked from manufacturers' tables. Mike also examined connection methods used for joining truss pieces. The two main techniques used are bolted truss and "spigoted" truss. Bolted truss uses attached bolting plates and Grade 8 bolts to join separate truss pieces into an assembled unit, while spigoted truss uses tabs located on the chord ends on one truss which are fitted into slots on the next, then pinned together with hitch pins. Both systems work very well within manufacturers guidelines, although spigoted truss tends to be a bit stronger due to a more efficient, continuous load pattern. The standard means of lifting a truss loads is using chain motors. These have been used for this purpose for years, and are solid and durable, a proven technology which can last a long time. But they will only do so dependably if they are properly maintained and tested for proper operation. Reed Rigging has a load testing machine which they use to test their motors annually. Any motor which does not meet specs is torn apart and repaired to assure safe operation. For instance, an important safety feature is the "Load Limiter". This device is designed to release without running at 125% of the motor's rated load. If the limiter does NOT release at that point, it can over stress the entire system, risking collapse. So a load limiter that does not operate properly must be replaced, and it can only be detected by testing. Rigging safety is about knowing the stresses and weight factors involved, and paying attention to detail. You must establish proper procedures and work habits that are consistent with manufacturers' guidelines, then follow them each and every time. Shortcuts, a lapse of attention, or insufficient training can all lead to an accident. But by knowing the hazards and using satisfactory design factors and adequate training, you should be able to rig your show safely.